A registered charity founded in 1984 by former Spitfire pilot Group Captain David Green RAF. Its original purpose was to link people throughout the world whose lives had in some way been concerned with the legendary World War 2 fighter. It now supports the interest of the many aviation enthusiasts of all ages who wish to support its aims. Encourage students of aeronautics, astronautics, aviation history and associated subjects in their interest. 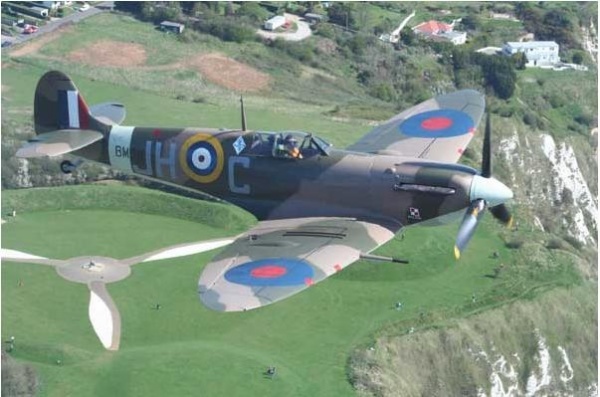 Research, study and assess the educational and historical value of the information relating to the Spitfire, its design, development and operations. Disseminate accurate information of historical and educational value on aeronautic subjects by means of presentations, seminars, lectures and the publication of books and articles. Taking an active part in the running of the Society. Enjoying the opportunities of meeting each other at various events throughout the year. Utilizing the services offered by the Society to its members. The publishing of the Society's journal "SPITFIRE"
The Society's associated organisation, Spitfire Enterprises Ltd., exists to offer for sale by mail order or directly at events a range of attractive sales items. How is the Spitfire Society organised? This has been recently reorganised, and there is now a management committee with a series of volunteers with roles defined by their responsibility within the Society. The Spitfire Society and Spitfire Enterprises Ltd. are both run on an entirely voluntary basis. Who may join the Spitfire Society? Membership is open to any person of any nationality. He/she may have had personal experience as a pilot, designer, constructor, researcher, historian or restorer, but the primary requirement is a wish to join us and support the aims of the Society. The current subscription is £20 (UK unless by UK bank transfer; see application form for details), or £25 for overseas membership renewable without reminder on the anniversary of first registration. There is now also a Junior Membership, at a reduced subscription rate of £7.50, open to all persons under the age of 21, or in full time education beyond that age. Family membership is also available at an annual subscription of £25.00.